I scratched today's post to reflect on what has happened in Connecticut today. I am deeply shocked and terribly saddened. I can't begin to imagine the pain that this small community is going through, most especially just a few days before Christmas. 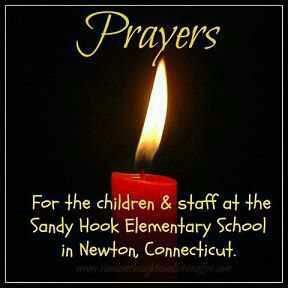 I pray that the Lord continues to shine his light upon them during this awful time. Thanks for those words. I am so grateful for our supportive community at a time like this. Words cannot convey my deep, deep profound sadness...there is no way to comprehend the killing of our little, tiny children and their care takers. My prayers of comfort, love and faith go to all the victims and all the adults and children who were witnesses and all the families. All of our lives have been changed forever.